This article will focus on your options for modern financial budgeting solutions for your Intacct ERP solution. Budgeting is a vital and important process, regardless of whether you are planning your personal finances or managing your organization’s budgets and forecasts. We have been seeing more and more budgeting tools hosted on the cloud and even though it seems pretty straightforward, most companies are still used to hosting their corporate performance management (CPM) tools on premises. 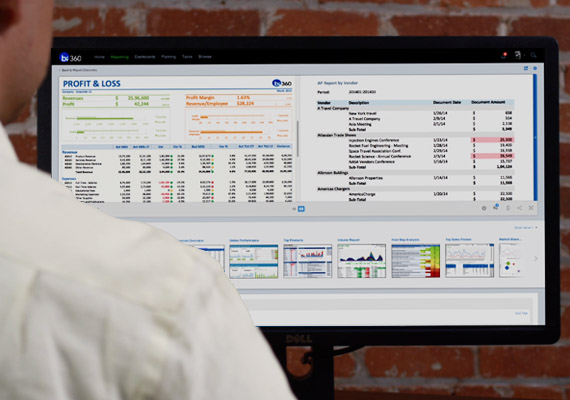 Choosing the right budgeting solution for your industry that integrates smoothly with your Intacct enterprise resource planning (ERP) system can be challenging, but you have powerful options, and it will give you more knowledge about budgeting solutions for your company. In this article, we will explore Cloud-based budgeting and some of those solutions for your Intacct ERP system. This article will discuss your options for modern financial reporting solutions with Intacct. Financial reporting is the cornerstone of corporate performance management (CPM), as the process does the work of summing up the financial health of your company. Today’s business world relies on financial reporting in a major, indispensable way. As it is a requisite aspect of running a business, automation of reporting processes and streamlining the content only makes sense. As you seek to understand the data that you pull from cloud and on-premise technologies, reporting is becoming more crucial, even just as a way to consolidate information. This article will zoom in on second generation cloud reporting tools and how the right one can benefit your data management and analysis tasks from your Intacct ERP system. This article discusses the differences between corporate performance management (CPM) and business intelligence (BI) solutions in the cloud technology era. On this blog, we write a lot about corporate performance management (CPM) tools. And we talk a lot about business intelligence (BI) solutions. In fact, we seemingly use the terms interchangeably – and there’s some thought behind that. BI and CPM exist in the same realm of enterprise technology that makes sense of the health of the organization. They both pull data from a variety of sources to crunch numbers and analyze information, so that you can pinpoint strengths, weaknesses, opportunities, and threats. However, there are some differences, and while their output might not seem mutually exclusive, there is not much overlap. As we continue our ascent to the new normal of cloud technology platforms, it will be helpful for companies to understand the differences between the two, so the right solutions can be deployed to meet organizational goals. This article will highlight the distinctions between BI and CPM solutions, so you can continue to build your cloud technology roadmap with precision. This article is the final installment in a series focused on how Corporate Performance Management (CPM) tools can serve as a true solution, particularly zooming in on budgeting and forecasting challenges companies face with data housed in multiple cloud and on-premise systems. The last blog article I wrote, I zoomed in further on the multi-cloud world that businesses today are navigating – and how Corporate Performance Management (CPM) and Business Intelligence (BI) processes and specifically, modern financial and operational reporting tools, can function as a complete solution to the related technological and data management oriented challenges we’re all facing. If you think about all of the essential enterprise technology solutions making the shift to the cloud, it can seem like a lot, especially in terms of the challenge to integrate and/or combine all of this diverse data. There are also on-premise tools, which is where plenty of accounting systems are still residing. But what about budgeting and forecasting – and all of the historical data from disparate sources needed to effectively plan? This article will focus on planning as an important BI and CPM process – and how the right application can be a true solution to your obstacles related to multi-cloud management. At the end of 2016, we sat down with CEO Nils Rasmussen, COO Corey Barak, CIO Hadrian Knotz, and CTO Mike Applegate to discuss 20 impactful years of being a leader in the Business Intelligence (BI) industry. This is the final segment in the series, where the executive team members discuss what differentiates BI360 and what they would like to be known for in 20 years. Before the holidays, we sat down with CEO Nils Rasmussen, COO Corey Barak, CIO Hadrian Knotz, and CTO Mike Applegate to discuss 20 impactful years of being a leader in the Business Intelligence (BI) industry. This is the second in a series, where the executive team members discuss the future of Solver and BI360 in terms of product innovation, customer and partner relationships, and the organization as a whole. I recently sat down with the leadership team at Solver to discuss the 20th anniversary of launching the organization. The following is the first in a series, where they talk about how the organization came about, where they have gone and been, why they launched BI360 and more, as they move toward a cloud deployment option in 2017. CEO Nils Rasmussen, COO Corey Barak, CIO Hadrian Knotz, and CTO Mike Applegate all chimed in about the successes and challenges that they have faced – and what they are most proud of on this anniversary. The importance of training is more than just the obvious. BI360 users will often say, “I don’t know how to use BI360, so let me take a training class.” Structured training is about the best way to learn how to use and become more efficient with BI360. As Solver’s Training Manager with over 15 years of training experience (two of those with our tool), I say this to everyone – never stop learning!